20.04.2019 17:41 - Rate the performance of each Avalanche player and the overall team performance during the last game. 18.04.2019 07:30 - Rate the performance of each Avalanche player and the overall team performance during the last game. 16.04.2019 06:30 - Rate the performance of each Avalanche player and the overall team performance during the last game. 14.04.2019 08:00 - Rate the performance of each Avalanche player and the overall team performance during the last game. 12.04.2019 06:30 - Rate the performance of each Avalanche player and the overall team performance during the last game. 07.04.2019 21:30 - Rate the performance of each Avalanche player and the overall team performance during the last game. 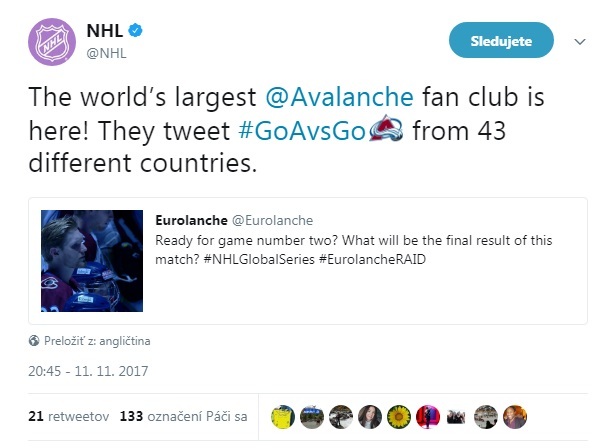 05.04.2019 20:00 - European fans will join up for Avalanche playoffs games watch parties. Skupinové pozeranie zápasov na play-off! 05.04.2019 20:00 - Európski fanušíkovia budú sledovať zápasy play-off spoločne. 05.04.2019 15:00 - Rate the performance of each Avalanche player and the overall team performance during the last game. 02.04.2019 12:30 - Rate the performance of each Avalanche player and the overall team performance during the last game.